Big things are happening at LitCap’s booth at the 2016 AAJ Winter Convention in Boca Raton. Not only are we sponsoring the golf simulator contest, we are officially launching our new product, LitCap FeeAero. 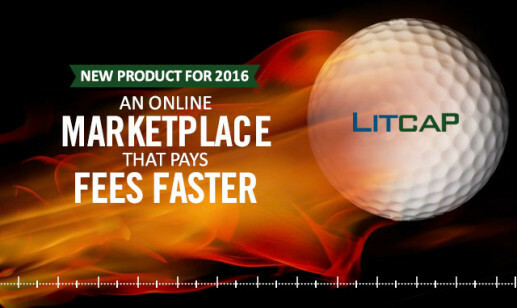 LitCap FeeAero is the only open online marketplace where attorneys can monetize a portion of their earned fees. FeeAero provides attorneys with instant access to capital in a flexible and easy to use online marketplace. The AAJ golf contest is a fun, interactive golf simulator that allows you to play for exciting prizes, including a Daily Grand Prize! Also enter for a chance to win an Apple Watch, given away by LitCap. To participate visit www.litcap.com/applewatch and use the code “123”. So come by, take your best swing and learn more about our new FeeAero product that helps pay your fees faster. This convention gets better each year. Come meet with leaders in your areas of practice and join the lively exchanges that take place during the more than 200 events at the convention. Accomplished trial lawyers and experts will discuss the latest developments in trial advocacy and specialized topics at 10 cutting-edge Continuing Legal Education (CLE) programs designed to help you better represent your clients. Earn up to a year’s worth of CLE credits at these programs created by plaintiff lawyers for plaintiff lawyers. Build powerful connections, increase your knowledge, and stay ahead of the curve when it comes to the latest developments in your practice area by attending Section, Litigation Group, and Committee meetings. Visit www.justicewinterconvention.org for the full conference schedule, registration, housing, and much more. Saturday, February 27, 2016 – 08:00 AM CST to Tuesday, March 1, 2016 – 8:00 PM CST.